Expect isolated rains and thunderstorm this afternoon as Typhoon Wipha will enter the Philippine area of responsibility, as reported by PAGASA. Typhoon Wipha will be locally codename as bagyong 'Tino' that forecast to move North Northwest. PAGASA weather bulletin as of 5 a.m. today, "the eye of Typhoon "WIPHA" (International Name) was located based on all available data at 1,280 km East of Extreme Northern Luzon." It has a maximum sustained winds of 160 kph and gustiness of up to 190 kph. said by PAGASA. 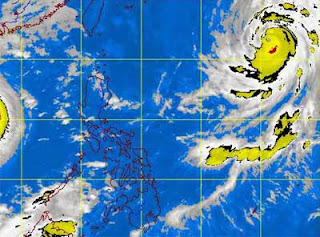 But PAGASA estimated that Typhoon Wipha would not make landfall over any part of the country. So don't forget to bring your rain protection wherever you go out for work or any destination this Monday. For the meantime, please bookmark this page now or visit this site more often for you to be updated. You may also share this post to your friends so they may know about PAGASA Weather Forecast on Monday, October 14, 2013. Comments or suggestions about "PAGASA Weather Forecast on Monday, October 14, 2013" is important to us, you may share it by using the comment box below.